Haddon Tools is the manufacturer and distributor of the LUMBER/MAKER, a chainsaw attachment that turns your saw into a low-cost lumber mill. We also manufacture and distribute the WOOD JOINER, which allows you to seamlessly create professional dowel joints. 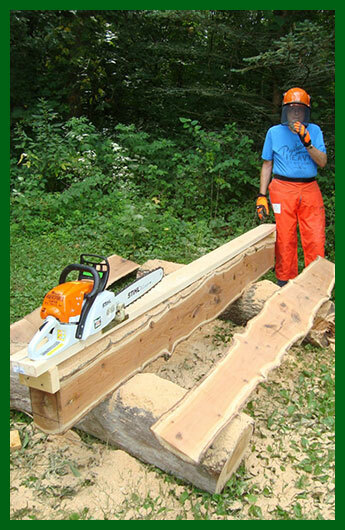 The Haddon LUMBER/MAKER is the perfect tool to turn any chainsaw into a handheld lumber mill. Easy to install and use, it is plated to prevent rust, and attaches to any factory chainsaw using just a clamp and three special set screws. The LUMBER/MAKER comes with a 30-page owner's manual. The owner's manual was written and copyrighted by Jesse Haddon, and it has 87 pictures and illustrations showing it's many uses beyond just sawing lumber, including crosscut sharpening tips that make it unnecessary to purchase a ripping chain.